In celebration of launching Reebok’s ground breaking PureMove, one-of-a-kind sports bra, H+K Dubai undertook a tremendous piece of work that once again saw H+K challenging stereotypes through sport. The team created an advertorial partnership between the brand and Emirates Woman – a high caliber female-focused magazine published in the UAE and found online. The partnership challenged a social taboo with a photo shoot connecting five diverse women with different interests and fitness abilities to amplify the message that the PureMove bra is for women who work out and want to find their confidence in working out. 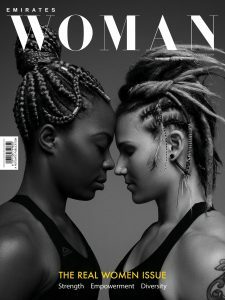 The partnership generated 14 pages of coverage in their October issue and included quotes from the women on confidence, Reebok, empowerment and unity. The conversation will be taken online as Emirates Woman will publish individual videos which include behind the scene shots and Q&A held with the women on the bra, the brand and their views in general on body image and self-confidence. Congratulations to the team of Joud Abu Shehabb, Stephen Reid, Stuart Milne and Yara Nimer for their exemplary work on this campaign.